With the occasion of the 20th anniversary of King Carl XVI Gustaf as Sweden’s regent, 15 September 1993, the Swedish Parliament and government decided to honor this event with a special gift for the King. 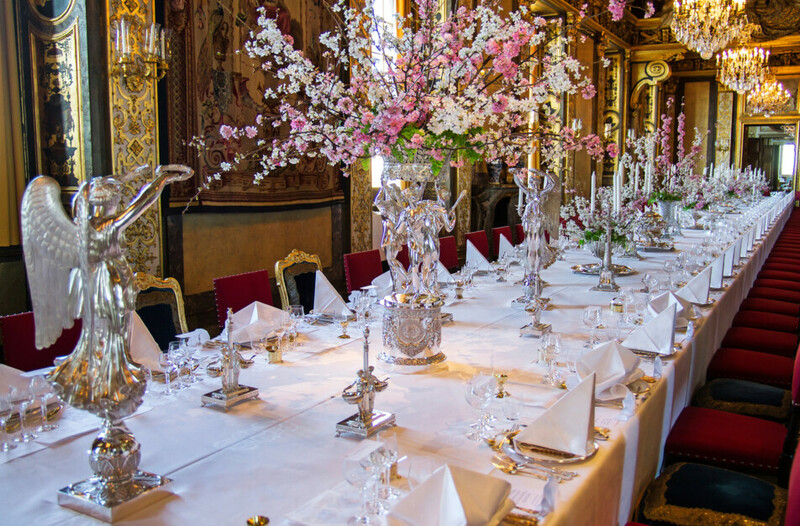 It consisted of a table linen which was intended for the official Royal table at Karl XI’s gallery at the Royal Palace. The present was handed over by the spokesperson of the Swedish Parliament at that time, Ingegerd Troedsson. The Royal table cloth consists of seven cloths of eight meters length and two cloths of four meters length, each with a width of three meters. There was only one hand loom available and capable considering this large width, while a machine loom was not available at this time. In addition, there were two hundred napkins accompanying the table cloths. Both the table linen and the napkins were woven in linen damask. The warp was of Italian linen no. 50 and the weft of Irish linen no. 60 with a density of 40×48 threads per centimeter. The pattern was composed by Karin Björquist, better known as a designer at Gustavsberg porcelain, with technical-textile assistance of Ingrid Dessau. Initiator and leader of the project were art critic Åke Livstedt and architect Magnus Silfverheim – the same people who were also part of the project team that created the Nobel concept of the Nobel banquet. Weaver for the project was Hans Thomsson, and even The School of the Association of Friends of Textile Art has contributed to it. And even on the Napkins the pattern consists of a broad wave figure covering the border of the cloth, and large scattered stars as a mirror around the Royal Couple’s mirror-monogram in the middle of the cloth. The stars refer to the Pole Star, an ancient symbol of the Swedish king. Hans Thomsson was born and raised in Hemse, Gotland – Sweden’s largest island. After high school he attended a weaving class at Säveskolan in Visby (Gotland) and did a six month internship at Hemslöjden in Visby. Later, he attended a weaving program at The Swedish School of Textiles (University of Borås) 1990-1991, which was followed up by a further course in Borås, 1992. During the years 1993-1998 he wove the Royal Cloth for King Carl XVI Gustaf, commissioned by Klässbols Linen Weaving Mill. 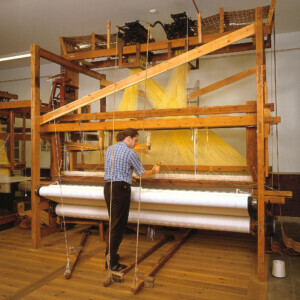 During the second half of 1998 he participated in a course about Jacquard-weaving in Florence. There he learned how to weave copies of fabrics with designs from the Renaissance, silk weaving of high quality, and about other bindings than those he had learned in Scandinavia. Over the years Hans Thomsson has received great confidence in many significant missions. Today he has his own studio in Äskekärr, nearby Kinnekulle, with the intention to weave linen damask.